It’s hard to write about Theatre Pro Rata’s production of Henry V right now. I saw it just before the election, and now, in the aftermath of the election, I’m struggling to form a set of coherent thoughts about it. Because I think you should see Henry V for a lot of reasons. It’s not perfect but there’s a whole lot of good stuff going on here. Director Matt Sciple has crafted a solid presentation of Shakespeare’s story. He’s winnowed it down into a more focused narrative. Shakespeare’s history plays are trying to cover a lot of ground, plus they’re tied to the plays that come before (Henry IV, parts 1 and 2) and after (Henry VI, parts 1, 2 and 3) and sometimes lean on their original British audience’s knowledge of the larger sweep of their own history. Modern audiences outside the United Kingdom can sometimes need a bit more help. Here, we get it. Sciple directed what is still my favorite production of Hamlet, out of all the many Hamlets which have crossed my path. For that reason, if Sciple’s directing Shakespeare, I will happily go. Plus, this Henry V has a great hook with its production concept. 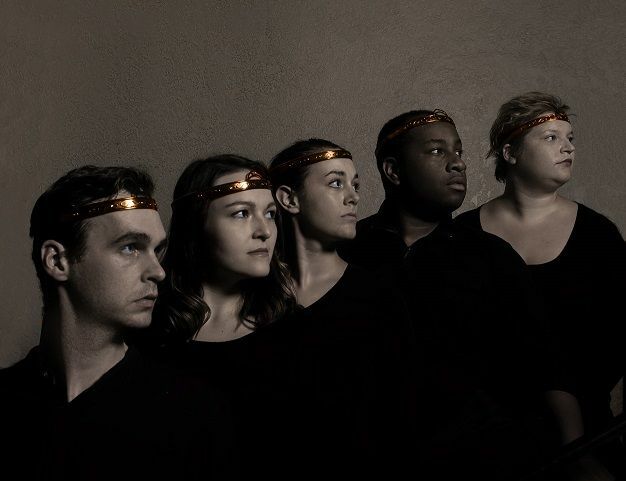 The story of Henry V is performed by an ensemble of just five actors (Ricardo Beaird, Becca Hart, Meredith Kind, Gabriel Murphy, and Victoria Pyan), each of whom take a turn playing Henry for a chunk of the story. You’d think that might have the potential to be confusing, but that production conceit - with one actor handing off the crown to the next - actually works quite well. Even though each actor has their own particular take on Henry, each stage of Henry’s story flows easily into the next. This is the clearest indicator that this ensemble is working well together as a single unit, with the singular purpose of a group story to be told. One is tempted to say the second half of the production works better than the first, but it’s almost two different kinds of storytelling that the plot requires. The second half doesn’t work without the first to set everything up. The first half is doing most of the heavy lifting so the second half can deliver all the big payoffs. There’s just an awful lot going on in that first half. Everyone’s playing multiple roles, and even the musician/music director, Derek Trost, gets in on the act. They have to set up everything going on in the English court, and then the English side of the battlefield. They have to set up everything on the French side as well. And yes, the English are putatively our heroes, but if the French aren’t fully formed human beings as well, then the story gets hopelessly lopsided and we start not to care when certain people are onstage. And we don’t want that. Long story short: Henry has been newly crowned king of England, having just recently left his days of debauchery as a young prince hanging out with riffraff on the wrong side of town behind him. His suddenly abandoned friends in the lower class are having a hard time with the transition. Meanwhile, Henry has decided to flex a little of his newfound royal muscle and lay claim, through a convoluted family tree, to parts of France. Naturally, the French are less than receptive to the idea. But when they get insulting about it, Henry decides it’s time to put on his big boy pants and lead an army into battle to take what he has decided belongs to him. War, naturally, brings out both the best and the worst in people, as war always does. A pivotal battle in that war is what consumes the bulk of the second half of the play. There is also a subplot that revolves around Katherine, the princess of France, who is likely to end up as part of the spoils of war. The problem I’m currently having with all that is - well, that Henry’s supposed to be our hero. A lot of people are going to die in any war he chooses to start. And I know we’re all supposed to hate the French, with their superior attitudes and their fancy accents but maybe the actors are doing their jobs too well here. Because we see the French as people, too. Maybe it’s just that I’m not into video games. I have a hard time rooting for carnage. Particularly when people seem to be instigating a war not because they have to, but because they feel like it. Sure, Henry goes in disguise down among his troops to gauge their spirits the night before the big battle. Sure, Henry is good at leading and inspiring his men to follow him into battle. Sure, he doesn’t overtly sacrifice their necks in order to save his own. But this, according to the play, is his chief accomplishment? War, for some land, and to bag himself a wife? Not doing anything to improve the general way of life of the people over whom he rules? Just a war. See, if I wrote this review pre-election, I’d probably be viewing it through a different lens. Right now, my view’s a bit cloudier, and I’m very likely saddling the play with the blame for things that are not the play’s fault. Staging Henry V with five actors playing multiple roles, as well as each of them taking on the role of Henry, is a monumental acting job, and the whole ensemble gets that job done. They tell the story with five people, and some assistance from the musician on stage with them. While the first act can be a challenge to take in fully in terms of information, the story is nonetheless clear. And when people start dropping in the course of battle, we feel a lot of those deaths because these characters have become human for us. The script contains some of Shakespeare’s most iconic and poetic speeches. This should be enough. And maybe that’s the point. Maybe as a modern audience, we’re supposed to be troubled by the story, and not just reflexively consume and reinforce its original lessons. But because it’s a history play, the end, just like in the original, ends up feeling a bit abrupt. After seeing Henry successful on the field of battle, and in the course of courting a new bride, the cast suddenly shifts to speaking of the next Henry, this Henry’s son, and the wars yet to come. But the play doesn’t give the audience much of a chance to take this in before it is truly done, once and for all. Sciple’s opening presentation, to get the storytelling rolling, finds Henry’s crown, cape and sword laid out on a bench, as if lying in state. The performers are summoned by the musician. They appear to be grieving their fallen leader, each in their own way. But they are there together, and it is here they decide to tell the story. Rather than return to that tableau for the end, Henry’s costume accessories are mounted on a mannequin at the back of the set. The audience has no frame of reference for the mannequin (though it’s used periodically throughout the play), and it’s incorporated so quickly because of the brevity of the epilogue that it’s hard to process what’s going on before it’s already over. A return to the opening image might have landed better, and reminded us why were were watching this story in the first place.